Over the years, the concept for managing the town centre during the races has been worked on just as much as the plans concerning the entire event area and racecourses. Diverse working processes are revised every year in order to bring improvements. Rass&Dorner are responsible for implementing these measures. The town centre should be a single whole, not confusing chaos, says Thomas Rass, from Rass&Dorner. The stalls offer various pleasures of the palate, resulting in an eclectic mix of tasty dishes, ranging from the strange sounding but delicious tasting Tyrolean “Ziachkiachl” and “Broadakrapfn”, to kebabs, a variety of sausages including Frankfurter and St. Johanner, specialities such as curried sausage, Bosna, hot dogs and more. “Prices are also very modest. Soft drinks will be offered at all official stalls in the town centre for no more than Euro 2.50 each.The environment is a key issue and returnable cups with a deposit system (1 Euro) will be used. Extra WC facilities are going to be installed for spectator’s comfort, with running warm water and sewer connection. All toilet facilities will have attendants on duty. Here too, we will ensure that operations run smoothly”. Special emphasis is placed on entertainment. Radio Tirol will guide us through the programme and tune the music genre to the skiers’ mood. Two live acts are booked to perform on stage, before and after the races. To date, Marc Pircher, voXXclub and Sarah Köll have confirmed participation. However, another well-known musician will perform as special guest on the stages of the city. The sound quality and accessibility have also been given an entire new footing. Twenty P.A. towers will flank the fans as they make their way from town to the event area. There are also five video walls with sound-system in the town centre and a special fan TV team will interview spectators to gauge the mood, while a fan reporter sends an account of events from the scene of all the action. One aspect was particularly important for those responsible for the races, which Thomas Rass explains briefly:“Information can be conveyed to all spectators in the race area as well as the centre of town at the press of a button”. Video walls will also be utilised to screen the latest happenings from the finish area”. 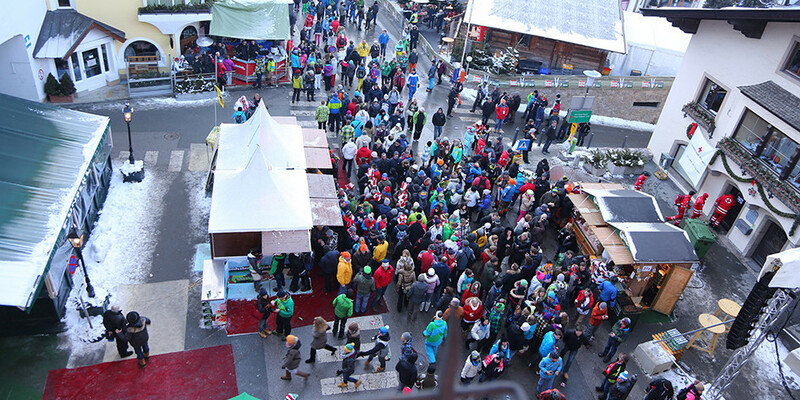 The quality standards in the town centre will match those at the Hahnenkamm Races.